Sorrento Italy is a coastal town whose origins are lost in the past, celebrated seaside resort whose fame has spread far beyond national borders. Think of Sorrento, it means thinking about its beauty, to recall the views that is able to offer in the eyes of the visitors, becoming part of the charm that made it famous in the world. The city center, is still arranged according to the ancient greek-roman planimetry, with streets that cross at right angles. Its greater economic resources are made by the tourist-hotel industry but an important role is also played by agriculture and seafood, as well as the flourishing handicraft. The municipality is hilly, it has one of the most beautiful landscapes in the peninsula, dominated by the profile of the Lattari mountains, surrounded by deep gorges. 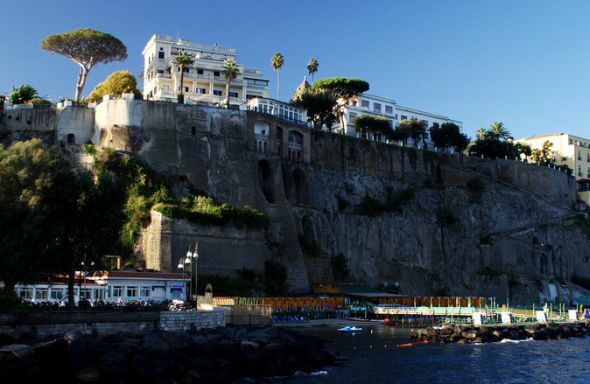 The town opens over the splendid Gulf of Naples, with high and rugged coastline surrounded by lush vegetation that break into steep cliffs and plunges peak in the blue waters of the sea. The close relationship with the sea, which has always characterized the city, return to the meaning of its name, perhaps derived from the greek verb that indicates the flow of water. In the past the town suffered the domain of Syracuse, the Samnites and Romans, who built luxury villas for their holidays. Sorrento has several archaeological sites, the remains of the villa of Grippa Postumus and Porta Romana, Porta Parsano and the villa of Pollio Felice and numerous monuments, churches and buildings that evoke its eventful past. World famous seaside resort, it offers countless ideas for trips and excursions, such as to Punta del Capo or to the Cave of the Sirens, where the water is shades of deep blue, or on the height of the Desert, where you can admire the two bays of the Sorrentine Peninsula and Mount Vesuvius with its volcano.